On this day in 1968- June 25, 1968 Bobby Bonds made his major league debut- and became only the second player at that time to have ever hit a grand slam home run in his first game. The other to do it was way back in 1898 Bill Duggleby. Since Bonds did it five other players have accomplished this feat. 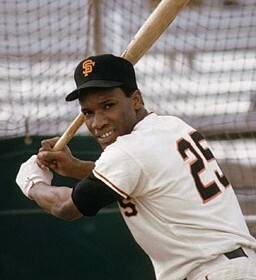 Bonds was one of the best baseball prospects of the late 1960’s- he drew comparisons to his new teammate Willie Mays. Bonds would have a very good career but never really fulfilled his potential due to off the field issues. In the second half of his career he became a punch line- in Terry Cashman’s great baseball song “Talkin’ Baseball” he sang “and Bobby Bonds can play for everyone.” In Bonds final eight seasons he played with eight different teams. Bonds son of course is the great Barry Bonds- like him or not- and I never cared for him- he is the best ballplayer I have ever seen since I started watching in 1967. Bobby and Barry the greatest father-son combination in baseball history. Ken Griffey Sr and Ken Griffey Jr would be the runner -up. Bobby was better than Griffey Sr and Barry was better than Junior Griffey-although Junior was one of the greats. Like father like son for Barry and Bobby in both good and bad ways.